Dry eye is a condition in which a person doesn’t have enough quality tears to lubricate and nourish the eye. Tears are necessary for maintaining the health of the front surface of the eye and for providing clear vision. Dry eye can occur when basal tear production decreases, tear evaporation increases, or tear composition is imbalanced. The experienced eye doctors at the Marietta Eye Clinic can help you determine if you are experiencing dry eye syndrome. Learn more about dry eye syndrome below. Do you sometimes wonder if the itchiness, dryness, and scratchiness you feel in your eyes is normal? Do you spend a lot of time in front of a computer? If you live with symptoms of dry eyes and over-the-counter eye drops don't permanently resolve your dryness, then you may need to see a dry eye specialist. Take our dry eye evaluation now and talk to one of our dry eye doctors. What are the symptoms and causes of dry eye? If your eyes are constantly itchy, burning or watering, you might be suffering from dry eye. Are there different types of dry eye? There are two main types of dry eye, evaporative and aqueous. A Marietta dry eye specialist can diagnose your type. 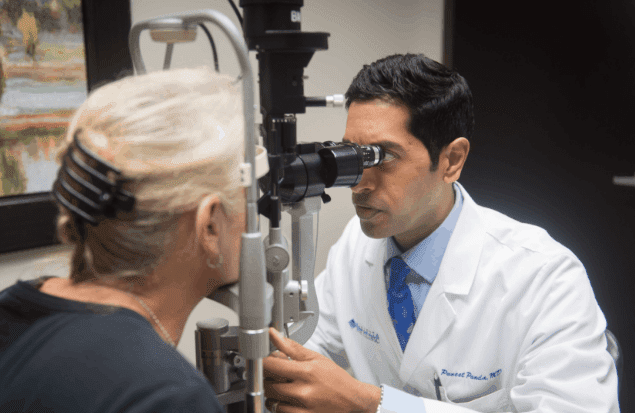 Following a comprehensive exam, a Marietta dry eye specialist can recommend the right treatment based on your condition. Dry eye syndrome affects many people and patients are often unaware that symptoms they are experiencing are indicators of dry eye. There are several very effective ways to treat this condition and bring relief.